Image courtesy of Basic Books. 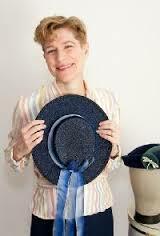 Oh boy, I am super excited about this: On Thursday, May 15th at 6pm Linda Przybszewski will be at Book Passage in the San Francisco Ferry Building reading from and signing her new book, The Lost Art of Dress: The Women Who Once Made America Stylish (Basic Books; 2014). Today, Americans are known for their sloppy dressing, but it was not always so. An Englishwoman who came to the States after WWII marveled at ‘the inherent good taste’ of the American woman. But American women weren’t born with good taste. They learned it from the Dress Doctors. And we can learn it again. I’ve just started reading this fascinating book (review coming soon) and I’m really looking forward to hearing what Ms. Przybyszewski has to say in person. Local readers, join me on Thursday, May 15th, 6pm at Book Passage, in the San Francisco Ferry building. It was liberating to spend the early part of my youth playing with clothes and finding my own style without the tyranny of being influenced by expensive labels … I think an eighteen-year-old with a luxury designer bag has missed out on a lot, not the least the excitement of it taking fifteen years to save up and buy one yourself. 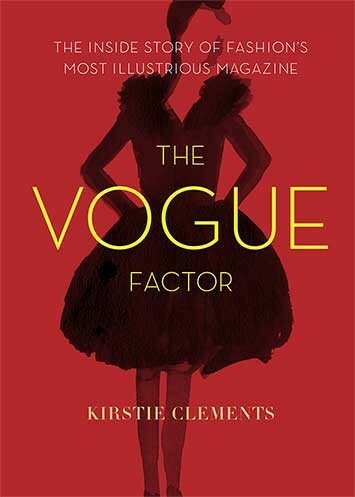 – Kirstie Clements, former editor-in-chief of Vogue Australia and author of The Vogue Factor (Chronicle Books, 2014). Click here to see an interview with Ms. Clements. A LV tote made of LV handbags. Designed by Marc Jacobs. Marc Jacobs & Louis Vuitton includes commentary by Mr. Jacobs as well as other fashion industry notables like Anna Wintour, in-house and backstage footage, and close-up peeks at fashion artisans at work. For example, we’re in on a creative meeting where Mr. Jacobs comes up with the crazy idea of making a tote from VL handbags. Then later we watch several artisans work on the bag, speaking French, trying to stitch leather on a huge industrial sewing machine. It looked like pure hell putting that bag together but the LV staff persevered (I suspect all French cursing was edited out) and got it done minutes before the Paris Fashion Week runway show. Apparently, 28 of those bags were ordered as a result. I wonder if the intrepid artisans got the hang of it by number 27. This film is a very informative behind-the-scenes view of the hectic life of a corporate fashion designer. It’s like taking a super fun fashion class without pop quizzes. We used to live in a world where people cared about how they dressed. I am shocked how often I will be out somewhere, whether on a street or in a restaurant, and I see only a handful of people who seem dressed appropriately, and even fewer dressed beautifully. – Linda Przybyszewski, associate professor of history at University of Notre Dame and author of The Lost Art of Dress: The Women Who Once Made America Stylish (Basic Books, 2014). Watch for my review of this book, coming soon. We all love our t-shirts but sometimes they could use a little pop. To help us out, New York City based fashion designers, Carmia Marshall and Carmen Webber (former Project Runway contestant) have just published a book with scads of DIY ideas for refashioning and refreshing the tee. 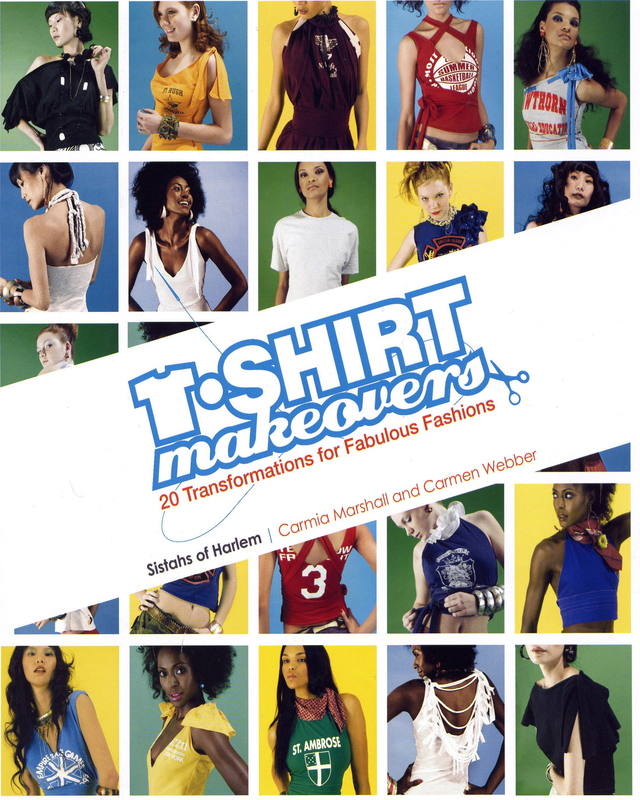 T-Shirt Makeovers: 20 Transformations for Fabulous Fashions (Glitterati Incorporated) includes instructions on how to take your comfy t-shirt and turn it into something super chic and fun. and the various styles of t-shirts. The writing duo also includes a very important chapter called Quick Tee Makeover Tips, which reminds us of some sewing basics such as ironing out wrinkles before getting started, the right and wrong sides of fabric, different pin types, and Cutting Rules. Each set of instructions has a list of what you need and a difficulty level, from pretty easy with no sewing machine to challenging, like the Deep V-neck with Ruffled Sleeve Dress – a dress make of three oversized tees. I tried the Simple Scoop Top and had it done in an hour. I started by taking my measurements and plugged those into the instructions before doing any cutting. I found that part to be a little unclear so I suggest a choosing a practice tee. Once I got past the measurements it was easy going. My favorite part of this particular design is the sleeves. 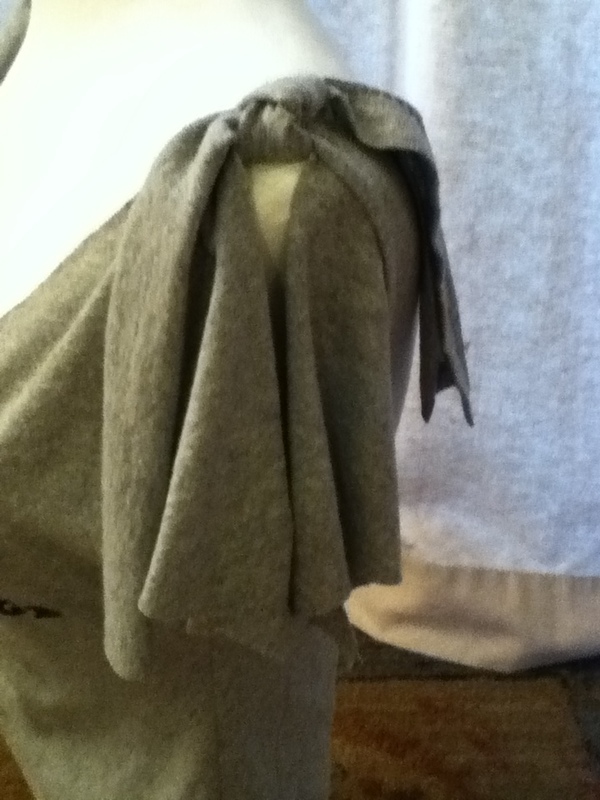 I cut up the middle of each one and the tied extra fabric, cut from the bottom of the tee, into a bow at the top. This creates movement and style to what was once a dull cap sleeve. In fact, it’s the reinvented sleeves that I like most about many of the designs by Ms. Marshall and Ms. Webber and in the Visual Glossary there are illustrations of various sleeve styles. What a handy guide just for general fashion knowledge! 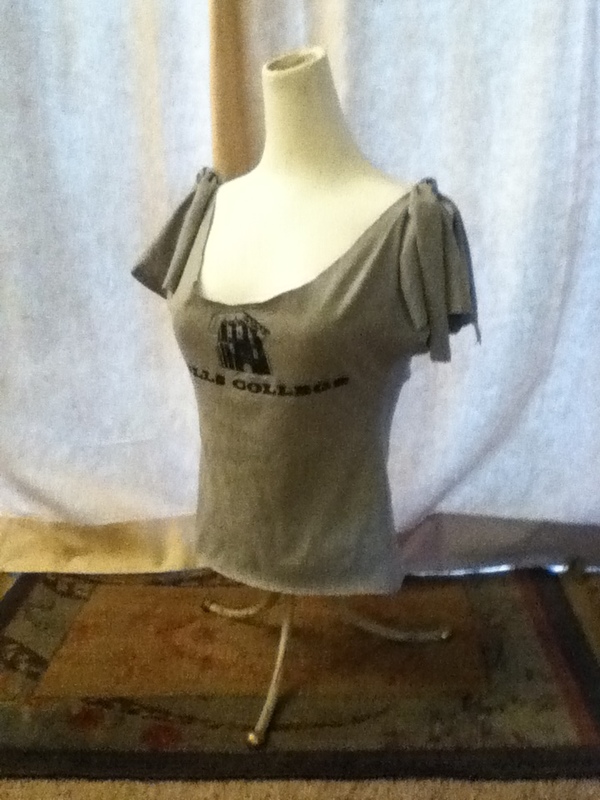 I think refashioning t-shirts is a great way for beginner designers as well as novice seamstresses to let loose with the scissors and think creativity. T-Shirt Makeovers: 20 Transformations for Fabulous Fashions helps lead our way. It’s kind of a charmed situation. 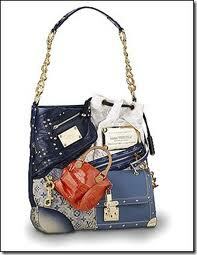 Anything that is associated with Marc Jacobs instantly becomes popular. It’s sort of the combination of extremely beautiful, extremely unpretentious, and extremely hip. I mean, the cachet is extraordinary. – Novelist Francine Prose speaking about fashion designer Marc Jacobs in the documentary film, Marc Jacobs & Louis Vuitton. 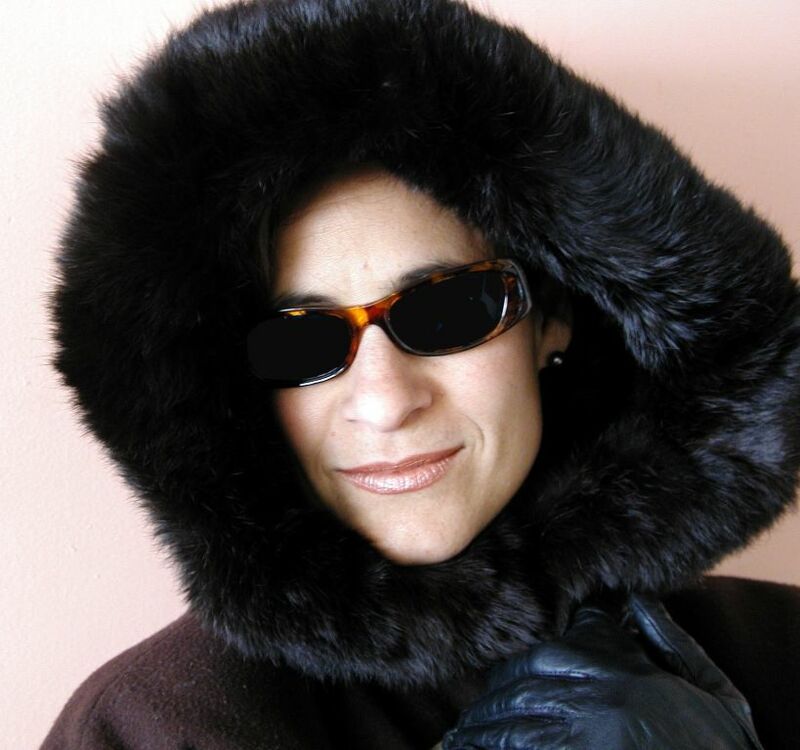 Unfashionable woman in fur-trimmed coat. Photo courtesy of Born Free USA. Many years ago a vintage fur coat was handed down to me from a distant relative. Even then I was anti-fur in fashion, however, I did wear it once and … felt a fool. So I decided to put the coat on consignment at a local vintage clothing store and give the money I made to People for Ethical Treatment of Animals. That was the best option I had at the time but what I really wanted to do was give the fur back to the animals. Sounds crazy, I know. Or maybe not. Now, thanks to Born Free USA, a global leader in animal welfare and wildlife conservation, we can give fur back. Born Free USA is running a donation drive called Fur for the Animals. The drive is collecting coats, hats, and other garments made from animal fur and donating them to wildlife animal rescue rehabilitation centers around the country. The centers use the fur to provide comfort and familiarity to young injured and sick wildlife in their care. Consider the source of fur. Fur for the Animals runs now through May 30, 2014. Do you have a fur something or other that has come your way? Why not give it back to the animals? 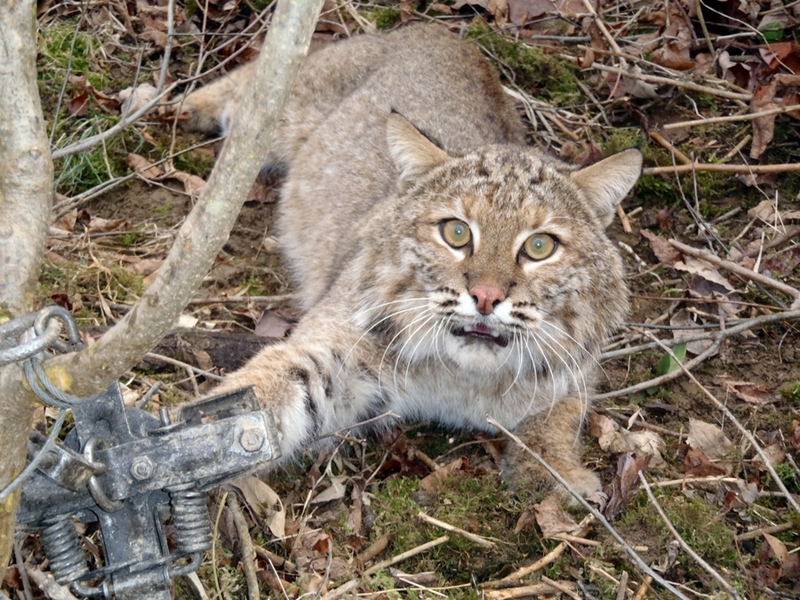 Thank you, Born Free USA for giving us the opportunity to put fur fashion to good use.